I spent months researching for this set. I used the plan for Nottingham castle where the true events the play is based on takes place. I had visited many castles during my time in london and wanted to give the audience the first hand experience of what being in a castle feels like. Cold, erie, damp and that certain heaviness that the walls have to them are all elements that an ancient castle exudes. I also wound up finding period tapestries almost by accident at a renaissance festival which helped add to the authentic medieval feel. In addition to striving for a true castle experience I wanted to create a "wow factor" for the audience and provide the ability for the set to transform into other locations in the story. I decided to make some of the walls of the set movable. The set had to be precise or it wouldn’t work. I finally landed on the idea of using turntables on the stage to allow quick transitions. The set movement and design had to work with weight, timing and the amount of room available on the stage and the turntable design worked perfectly. 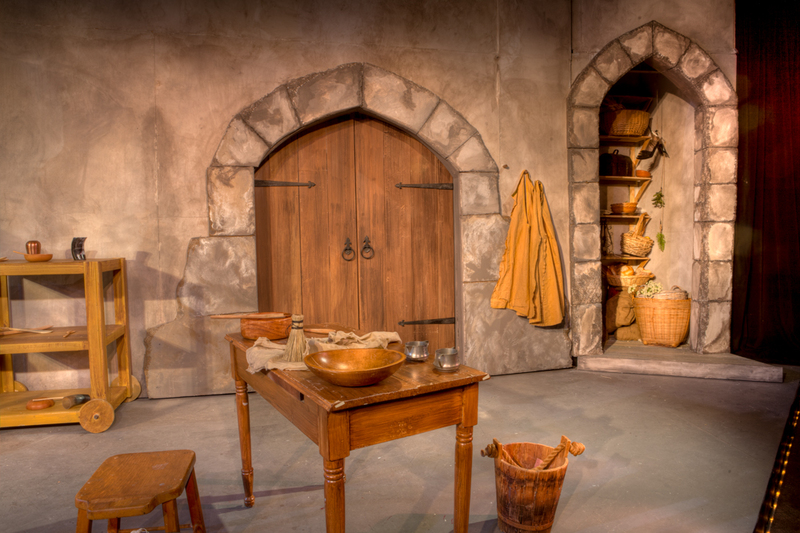 Through careful planning and execution the set came to life and served as the perfect addition the to play.